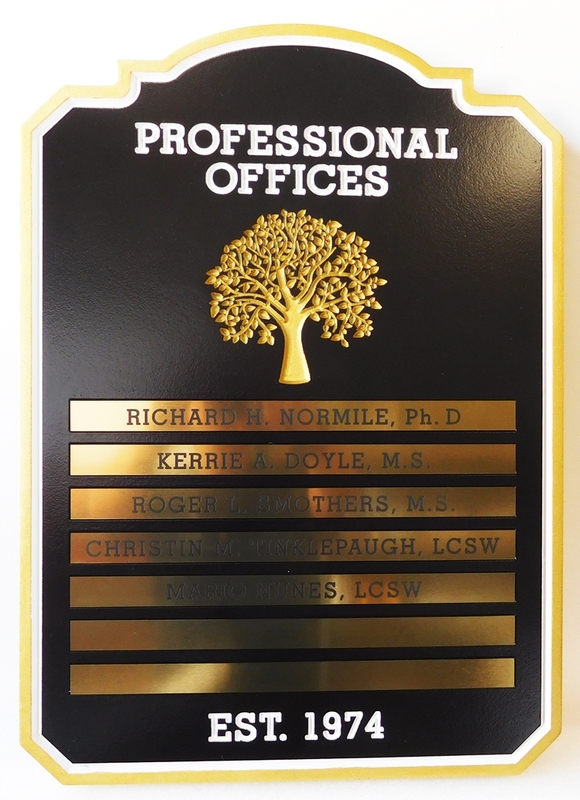 Above is a carved, HDU sign for professional offices with office names V-carved on individual brass plaques mounted on the sign. The tree logo, sign borders and text are carved 2 1/2 D (raised). The sign is painted in automotive-grade, finest quality Matthews paints and double clear coated with highest quality Matthews clear coat for added durability and UV protection. 24K gold gilt has been applied to the sign borders. o see 250 other sandblasted, engraved, carved 2.5D, or premium carved 3D High-Density-Urethane (HDU) and wood signs and plaques for attorneys, law offices, prosecutors, judge chambers and courtrooms, please click on Gallery 10 - Attorney , Law Office, and Courthouse Signs and Plaques.